A Tokyo native, Emi enjoys meeting travelers to share her cuisine and culture over a beautifully prepared Japanese homecooked meal. She is very passionate about cooking traditional Japanese home-style cuisine and will teach you to make 3-5 authentic dishes, served on beautiful dining tableware - so have your cameras ready for incredible pictures of your unique Japanese cuisine experience. Join Emi and learn to make a healthy, fresh and well seasoned meal, finished off with a delicious dessert and a cup of hot green tea during this memorable culinary and cultural experience with an expert local cook. Emi will greet you at the door and welcome you into her kitchen studio. Your cooking class will last 1.5 - 2 hours before you share the meal you helped prepare over conversation with Emi. You will learn to cook authentic Japanese food in the Teishoku style, characterized by the use of several vegetables as side dishes and a meat or fish as the main. Your meal may include dishes such as ginger pork, chicken teriyaki, chicken karaage or slow cooked grilled fish as the main. 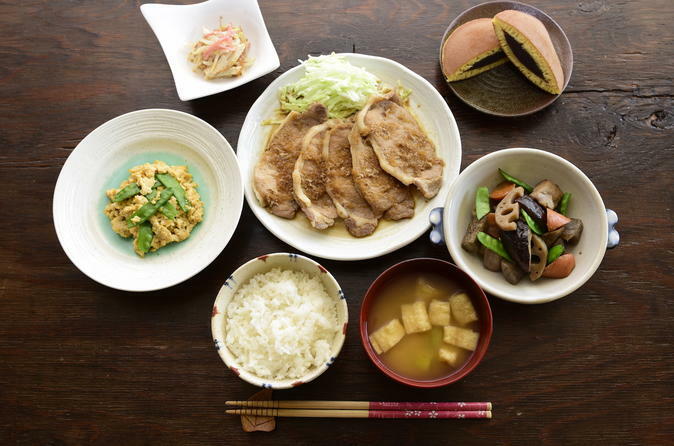 You will also learn to cook and share side dishes such as miso soup, nimono (slow cooked vegetables and meat with soy sauce and other traditional ingredients), marinated vegetables and fishcake, or stir fried egg and vegetables. Leave with a full stomach and fond memories of this authentic culinary experience! Emi requests a minimum of 2 people for this booking. If you are vegetarian Emi is happy to accommodate your request but note that the menu for the entire group will be vegetarian.